This quilt was finished just this past week, so I'm hoping that I may be on a roll of a quilt a month. Well, we'll see come planting time. Then it may turn into a quilt a season! The inspiration for this quilt came from here. Who doesn't love Schnibbles patterns? They are always adorable. The problem is though, that they are always small. (I mean the finished quilt.) And that's the whole point of the patterns. But it doesn't work out so well when you want to make a larger quilt with the pattern....unless you just want to make a gazillion of the blocks. Or if you're math inclined, size all the blocks up using your super math powers. I don't have super math powers (AT ALL) and I didn't want to pay for the pattern with shipping (because I am somewhat cheap) so I looked at it and said, "Yeah, I can do that" and went with it. I picked a size that I wanted my houses to be and then created the rest of the quilt from that. The finished size came out to be 49"x60". And if you know me and quilts, you know that I love stars. I wanted to incorporate them in this quilt somehow. Originally my plan was to have all the star blocks next to each other, like the houses did, but the math and the block size got way too tricky so I just ended up putting the sashing in between them instead. I was so proud of myself with this quilt because with the exception of ONE of the fabrics, everything came from my stash. Now that is an accomplishment. Overall, I'm happy with how it turned out. 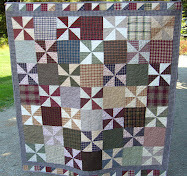 A friend of mine, Debi, did the quilting. I found the swirl pattern on a quilt in my "Simple Blessings" quilt book and knew I wanted to use it on this quilt. P.P.S. And just as a side note... A special little girl turned 5 recently and guess what she got for her birthday? A new sewing machine. And she's been sewing on it ever since..... That warms a sewing mommy's heart. I like it! I'm impressed with your figuring skills! Simply beautiful! I can't wait to see it in person and I really am excited to see what that sweet girl of yours is sewing! I just discovered your gorgeous quilt! It is stunning. I am making a homespun quilt now and have so much fabric left over, so started googling homespun quilts for my next project. Yours was my absolute favorite. I even have the Schnibbles pattern, but agree that those houses are just too teeny for a quilt like this. Your quilt is inspiring me...just so beautiful!